It’s probably no surprise that the supers RPG I wrote is, most days, my favorite. “Why” is hopefully the more interesting question. When we wrote Four Colors al Fresco back in 1999/2000, the supers RPG scene, even moreso than RPGs in general, was very different from today. With two minor† exceptions, all supers RPGs up to that point had the same fundamental structure, focusing on modeling superpowers with varying degrees of detail and complexity. Marvel Superheroes (and others) had extensive lists to try to cover every power imaginable. Champions (and others) instead provided a system to build your power, detail by detail*. Picking a favorite RPG publisher is at once very easy and very hard for me. The hard part is there are a lot of games I absolutely love, and they come from a lot of different publishers. And there are lots of publishers that deserve the accolades for various reasons. And writing something like this, I don’t want to leave any of my favorites out. On the other hand, looking back at my favorite games, and then looking at their whole catalogs, it’s really not a contest. Very few publishers have produced more than 1 or 2 games that have blown me away. Most of my favorite games are long out of print and their publishers no longer exist. Even those companies that published some of my favorite games and which still exist have, in several cases, not produced anything to my taste for years (or decades) now. And I decided not to count any publisher that has only produced 1 or 2 games in total, since if I love those it’s hard to say that really is a reflection on the publisher. No, considering all of this, Atlas Games stands head and shoulders above the rest for me. 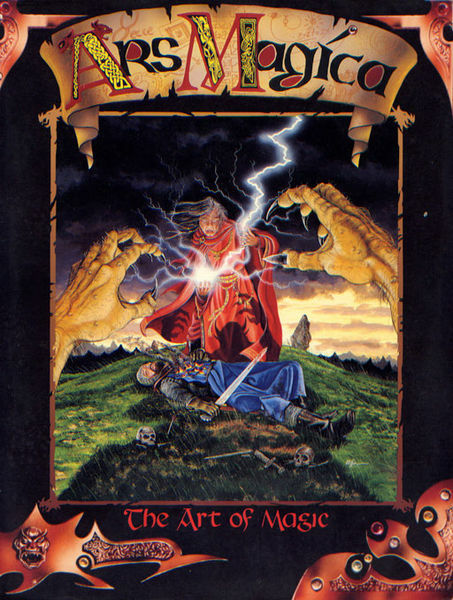 Back when they were Lion Rampant games, they published what might be my very favorite RPG of all time, Ars Magica, and then half a decade later re-acquired it and revitalized it, and now publish a steady stream of amazing books for it. 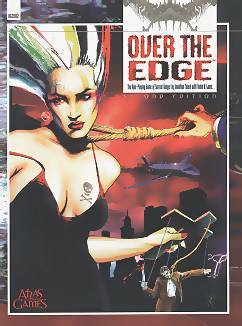 Over the Edge is another of my very favorite games, and it and Ars Magica are the games that opened my eyes to the possibility of new playstyles. Before those two games, everything I had every played was basically the same game, just with different numbers and setting details (Top Secret, AD&D, Gamma World, and a whole bunch of other late-’70s/early-’80s games). Who knows? If not for those two games, (and their reviews in Dragon Magazine that alerted me to their existence), I might never have discovered that there was a whole world of RPGs more to my taste. And then there’s the steady stream of hits they’ve had over the years—Feng Shui, Nyambe, Unknown Armies—every one of which has been perfectly to my taste. In fact, other than their D20 System books, they haven’t published an RPG I don’t enjoy, and in most cases love. And even there, they have published a significant percentage of the few D&D-ish D20 System books I own. On top of all that, Atlas is in my neck of the woods, so I see them all the time at local conventions, so I think that makes Atlas Games’ staff the only publishers (other than 1-person indie shops) that I’ve actually gamed with. Though that’s just icing on the cake, not a deciding factor. There is an honorable mentions, however. Fifteen years ago, Hogshead probably would have been the focus of this essay. Other than Warhammer Fantasy, which I’ve never been particularly into, I think i bought everything that they ever published: the “New Style” line was filled with wonderful experimental games (several of which are still cutting-edge in some ways), and Interactive Fantasy is one of my most treasured RPG works (and still has not been completely eclipsed by subsequent design theory). And then there’s Nobilis. I’m an RPG hacker, tinkerer, and designer. Most RPG systems have at least some appeal to me, and tons of systems have bits of them that are my favorite implementation of that bit. On top of that, even clearly flawed systems are often my right-now favorite while I’m playing them. So picking a favorite RPG system is quite possibly even harder than picking a favorite RPG. I’ll exclude anything I’ve designed, just on principle, and try to narrow it down at least. A couple of my favorite games are such in part due to their systems. I’ve used the core of Ars Magica to build a general fantasy game, but I think most of what makes it appealing to me is specific to the setting—once you strip all that away, it’s a pretty simple system, which is mostly good, but also doesn’t make it very distinctive. 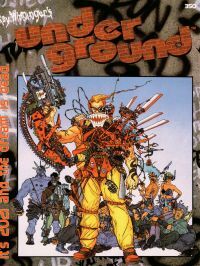 Underground is a more novel core system—a human-scaled version of the system from the old DC Heroes game. It breaks DC Heroes’ lovely 3×3 stat symmetry (three each of mental, physical, and social/spiritual, each split into power, finesse, and resistance), but is otherwise an excellent refinement and expansion, turning it into a very elegant gamist/simulationist system that handles a wide range of numbers and facilitates easy conversion between units (i.e., from speed to distance or strength to mass, and the like). Aria is another old system, quite crunchy and detailed, that I continue to love for the clevernesses in how it all comes together. A lot of people found the book “pretentious” due to its insistence on eschewing the traditional RPG jargon in favor of using standard dictionary words in accordance with their conventional definitions, but once you get past that to the underlying system, it is one of the better systems I’ve ever encountered. And it’s magic-building rules are probably the only thing to out-do both The Primal Order and Ars Magica. Though these days, if I wanted a crunchy system, it would probably be Burning Wheel. It’s probably the only crunchy system I’ve actually enjoyed running. While it has a lot of detail, it all falls together very elegantly, all makes sense, and the numbers work out mathematically, do what they claim to do, and both make sense and are fun in play for the most part. No boring can’t-lose fights; no whiff-filled endless challenges. If I ever run it again, I’d like to try some sort of abstracted system for wises, like the Circles system, instead of tracking them individually, but that’s my only complaint. And the way all the bits interact just perfectly is amazing, and makes running and playing it fun. It’s probably the only game I’ve found that could handle a Cyrano-style simultaneous duel of wits and rapiers, and make both halves equally interesting and equally fraught with peril. Generally, however, I go in for less-detailed systems. 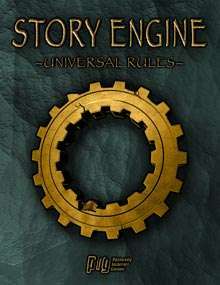 For a long time, Story Engine (originally used in Maelstrom Storytelling) was my favorite system. It uses an interesting structure, focused on scenes and narrative control rather than either simulation or difficulty, and pioneered a lot of the play style that was reinvented by the rise of Narrativist indie RPGs nearly a decade later. It’s also unusual in being structured such that cooperative rolls are the norm—typical difficulties are out of reach of a typical character acting by themselves. In that vein, Primetime Adventures and The Shadow of Yesterday (TSoY) might be the best examples yet of two different developments of that Narrativist structure. I prefer Primetime Adventures, which is about as far as a system can go in focusing on authorial control while still having any character-differentiating mechanics at all. It’s the game system I choose when I have an interesting setting in mind and don’t want to create my own rules—it has replaced CORPS, Fudge, and Savage Worlds for me as my default generic system. But I have to admire the amazing balancing act TSoY pulls off, sneaking authorial directives into its Keys under the guise of character motivations, and basing rolls on character capabilities but using the results of those rolls to determine narrative control rather than success. It’s the game system we just chose when we were playing something else and loved the game but the rules were not gelling for us, and it has been used as the basis for more than a few other games, most notably Lady Blackbird. I also need to mention two systems that are amazing, but a bit tied to their settings. Zero has a very clever system that inherently trades off specialization and breadth: by using a fixed skill list of just the right length, the d6 x d6 roll perfectly scales such that the more skills you have the less good you are at each of them, without needing to fiddle with skill points or any other bookkeeping. While other parts are specific to its setting, that core is something I’ve reused elsewhere, because there’s really nothing else that does that so smoothly. Meanwhile, Everway is simply in a world of its own. Every part of that system is awesome, from chargen based on inspirational images, through metaphorical primary traits, to the best way yet to quantify an infinite variety of special powers. [Is it frequently useful? versatile? powerful? Total the yeses up and you have your cost.] I’ve adapted it for space opera, and others have adapted it for supers, and I’m sure it could form the core of any number of other fantastical (as opposed to more realistic) settings, though with a little more work than for adapting a more traditional system. But if I had to pick just one system to use from now on, I think it would be Over the Edge. For me, it’s the perfect balance of words (mostly) and numbers (just a few). It’s focused on character capability, but boils everything down to a small number of stats, with an easy default roll built in. The way that it uses dice is also genius, providing bonuses and penalties that don’t change the range of the roll and don’t require complex—or really any—math (beyond the basic addition you need for an unmodified roll). It’s much like TSoY in feel and goals, though without the excellent Keys mechanics, but simpler and more free-form, so easier to adapt. There’s weird, and then there’s weird. I have several RPGs that do some variation on “all the wacky things are true!”: Over the Edge, Pandemonium!, and InSpectres. And then there are the various “let’s mash these seven genres together” games like Feng Shui, Torg, and Providence. Providence deserves special attention, because rather than providing different areas for all its elements, it just layers them all together: a world of winged people, where various types of wings and degrees of wingedness are the basis for a rigid caste system in a pre-modern society with lots of unexplored deadly wilderness surrounding it. And there is magic of a wizardly sort that some characters use. So far, basically standard fantasy, but with bird- and bat-people. But then we add in a significant mystical martial art system and a whole chunk of society about this—its wuxia! Oh, and there is a major thread about the oppressed wingless people fomenting revolution—it’s got punk elements (“wingpunk”?). On top of all this, it’s a supers game—in fact, that was how it was originally sold, almost completely eliding all of the other elements except the wings. So, by default, all of your characters are supers. Not everyone in the world, of course—while magic and mysticism are widespread “normal” things, superpowers are unusual and exceptional (i.e., the usual for the supers genre). And on top of all that, its set inside a hollow world, and the very world itself is self-destructing. And there’s nowhere to go, but the people originally came here via magical portal to escape their old world which was being devoured by monsters, so maybe they can rediscover how to open a portal to another world. In any case, its the same threat from their old world that has caught up with them. So it’s apocalyptic with a touch of Cthulhu and a dash of world-hopping. Despite all this, Providence actually holds together pretty well. It doesn’t feel so much like a mishmash as like a very complex and layered setting. It’s certainly unique. And the superpower rules are pretty good—I’d use them for a regular supers game. But for just plain weird, I’m going to give the runner-up status to two games that play with the notion of what it means to be a person. Khaotic is about a group sent ahead to survey/pacify a planet, except the transmat process results in all the PCs being stuck sharing a single body, so you have to work together and/or take turns controlling the body. Zero is the story of people who have always been part of a collective consciousness, but find themselves individuals one day, for no known reason. So you need to figure out what has happened, and either rejoin the collective or learn how to live as individuals. But I think the weirdest game I have is Lowlife, Andy Hopp’s bizarre flight of fancy. It is a postapocalyptic fantasy unlike any other you have likely seen. Humanity is gone, and our dregs have inherited the earth. 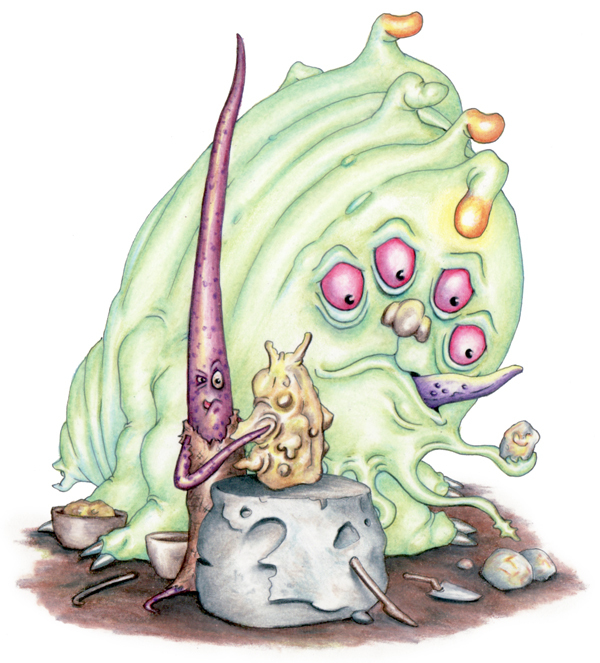 The new rulers of the land are the evolved sentient(-ish) descendants of our detritus: sentient twinkles, cockroaches, and industrial goo. Here’s an example; go to his webpage (above) for much more Lowlife and his other awesome work.